↑ David Eggenberger, An Encyclopedia of Battles, (Dover Publications, 1985), 85. ↑ Keegan & Wheatcroft, Who's Who in Military History, Routledge, 1996. p. 268 "In 1515 Selim marched east with some 60,000 men; a proportion of these were skilled Janissaries, certainly the best infantry in Asia, and the sipahis, equally well-trained and disciplined cavalry. 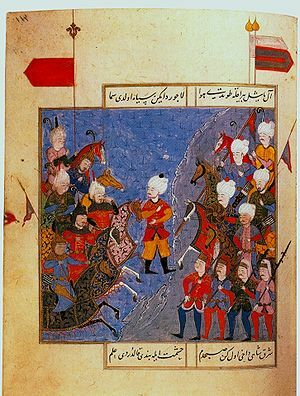 […] The Azerbaijanian army, under Shah Ismail, was almost entirely composed of Turcoman tribal levies, a courageous but ill-disciplined cavalry army. Slightly inferior in numbers to the Turks, their charges broke against the Janissaries, who had taken up fixed positions behind rudimentary field works." ^ ا ب Kenneth Chase, Firearms: A Global History to 1700, 120.